This book, first published in 1914, contains five historical essays. Three of them are on the concept of judicial review, which is defined as the power of a court to review and invalidate unlawful acts by the legislative and executive branches of government. One chapter addresses the historical controversy over states' rights. 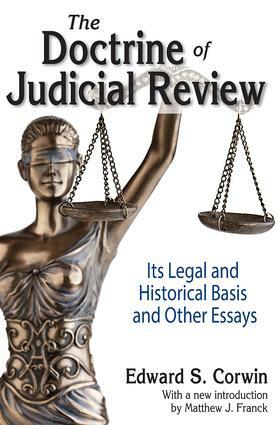 Another concerns the Pelatiah Webster Myth�the notion that the US Constitution was the work of a single person.In "Marbury v. Madison and the Doctrine of Judicial Review," Edward S. Corwin analyzes the legal source of the power of the Supreme Court to review acts of Congress. "We, the People" examines the rights of states in relation to secession and nullification. "The Pelatiah Webster Myth" demolishes Hannis Taylor's thesis that Webster was the "secret" author of the constitution. "The Dred Scott Decision" considers Chief Justice Taney's argument concerning Scott's title to citizenship under the Constitution. "Some Possibilities in the Way of Treaty-Making" discusses how the US Constitution relates to international treaties.Matthew J. Franck's new introduction to this centennial edition situates Corwin's career in the history of judicial review both as a concept and as a political reality.